No offense to Microsoft Word and Apple’s Pages, but neither one had really hit the spot for a go-to Mac word processor for me. Even after years of using Word, drawing a table or making columns seems harder than necessary. And the new Pages is clunky and seems like it wants to hide my saved documents from me. I started using Scrivener this summer, but, as Scrivener is the first to acknowledge, that program is not designed for tweaking the layout and final draft of a document. A number of Scrivener users I interact with recommend Nisus Writer Pro. I’ve been using it regularly for about a month, and see no need to use another word processing program from now on. Nisus Writer Pro is to my word processing what the Kansas City Royals are to baseball right now: fresh, fun, powerful, and totally adept at getting the job done. It’s a sophisticated program, with a lot of customization options I’ve barely begun to use. But the first time I used it I was able to almost immediately–without even reading the Help!–get my document to do the handful of things I wanted it to do. At the very top of the screenshot you’ll see the Word Count in the footer (i.e., of every page). 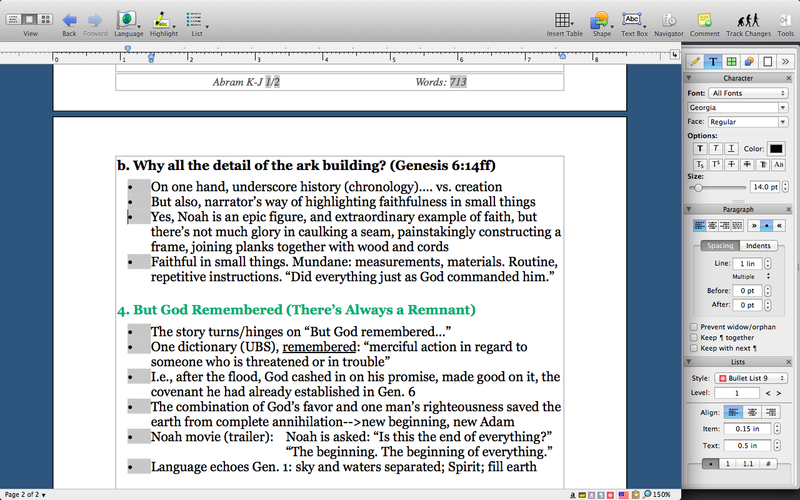 This is easy to set up–the Insert menu gives you the option to insert Automatic Numbers there, one of which is the word count, which I like to have in front of me as I whittle down my weekly sermons to something that will keep all of us awake. This means your NWP documents are fairly universal. You can open aforementioned Word (.docx) documents easily. Pages (.pages) is another story, but I think I’m over it. You can also hide the palette so you’ve just got the document in front of you. Via palettes you control styles, font/formatting, tables, drawing, etc. One of the drop-down menus has an “Activate Bookends” command. There’s some nifty integration between that program and Nisus Writer Pro. NWP’s User Guide clocks in at 500 pages. Yes, I read it all for this review–no, not really. But it’s an invaluable reference. Download it here. The staff I’ve interacted with is really great. And there are active user forums. This late 2008 MacBook o’ mine is the little (computer) engine that could. But it’s slowing down. Word and Pages (sorry, Microsoft and Apple! I didn’t intend to use your products as foils) both run sluggishly sometimes on this machine, but Nisus Writer Pro never has. It starts right up, closes right down, and never is glitchy in between. You can see a lot more of the features of Nisus Writer Pro here, where you can also download a free 15-day trial, while you await Game 3 of Royals vs. Orioles. The folks at Nisus kindly supplied me with a license of NWP for the purposes of review. Nice review. I was directed here from the Nisus newsletter. I’m eager to read about your experience with Textilus. I sought out Textilus for the same reason as you did, to be able to use RTF on the iPad. For various reasons I ended up switching to iA Writer as my mobile text editor, one of which was because Markdown is much more widely supported in mobile apps than RTF (much to my regret!). Hello–thanks for the comment! Believe it or not, I’ve never used markdown, so would be curious to hear more about your experience with it. I have Textilus now, so will be reviewing it soon, especially with an eye toward how it integrates with Nisus. For your iPad, you might consider OfficeSuite or OfficeSuite Pro. I use it on my Nexus 7, and am very satisfied with it, except that, on the Nexus, at least, it apparently does not handle tabs quite right. Otherwise, the formatting is excellent. Thanks for the suggestion–is this what you are referring to? And it integrates well with NWP? Yes, Abram, that is the program. It is the only one I found for use on my Android tablet that works at all well. Most of the text editors and readers are not configured to decipher the format of .rtf documents properly, so they display the formatting commands, as well as the text. Perhaps you are aware that Apple has a modified .rtf format, tagged as .rtfd (“Rich Text Format Directory,” “Rich Text Format with Attachments”) that allows graphics and other attachments to be “bundled” with the text document. If you right-click on the Finder listing of an .rtfd document, one of the options is “Show Package Contents.” Selecting that option opens a Finder window that lists all the pieces in the document, with the text file titled as “TXT.rtf.” You can examine all the pieces individually. The .rtfd format is called a “bundle,” and very few word processors are capable of handling it properly. They treat it as a “folder,” which can be opened and the various elements examined, but editing the “TXT.rtf” file with anything other than an Apple-compatible text-editor will destroy the format. (See http://en.wikipedia.org/wiki/Rich_Text_Format_Directory) Unfortunately, OfficeSuite under Android (and most other OS’s) cannot handle the .rtfd “bundle.” The problem appears to be in the OS’s, so I do not know whether Office Suite will open .rtfd bundles correctly in iOS, but I suspect it should. OfficeSuite Reader is free, and OfficeSuite Pro costs $7.49, but is delivered as a trial version. For whatever it’s worth, are you familiar with “Text Edit”? It is one of the best simple word processors I have ever encountered, but in my experience, many, if not most, OS X users are unaware of it. The program is bundled with every version of OS X, and I use it to write 99% of my documents. It’s less than 2 MB in size, so it loads very quickly, and handles all the basic functions, including multiple fonts, italics, underline, bold, etc., and can even build tables, but the margins are fixed at one inch. When graphics are included in the file, it becomes an .rtfd, as described above. “Text Edit” is in the Applications folder of the computer. Press and hold the Command and Shift keys, and tap the “A” key to open the folder quickly. I have just read that Apple is rumored to be developing versions of “Text Edit” and “Preview” for iOS 8, which should solve your .rtf problem. Meanwhile, try OfficeSuite. Another very nifty OS X word processor is “Bean.” It’s essentially a powered-up version of Text Edit, with word- and character-counting capability, and has a slide-out “Inspector” window similar to the formatting windows in Nisus. It is free, but I have just learned that, unfortunately, it is no longer being actively developed. You might wish to examine it anyway. I apologize for this lengthy reply, and thank you for your patience.